Since I will be offline in the coming three days, I would like to greet everybody Happy New Year!!!!! Special thanks to hanashi, richard, qru, tenner, kaeru and those I haven't mentionned, you guys have been great and I learn a lot from you guys throughout the year. If you are using OpenBSD desktop, and you are bugging that there's no flash plugin available for Firefox, you may consider installing Opera browser from ports. The flash plugin is available via port as well and you just have to install it. Once finish the installation from ports, just launch the shiny Opera Web Browser and loading the page with flash animation, everything is working fine and you should be happy user of Opera since it is really fast. If anyone can get flash plugin working on firefox, please leave comment and pointing out, I would like to know the trick. 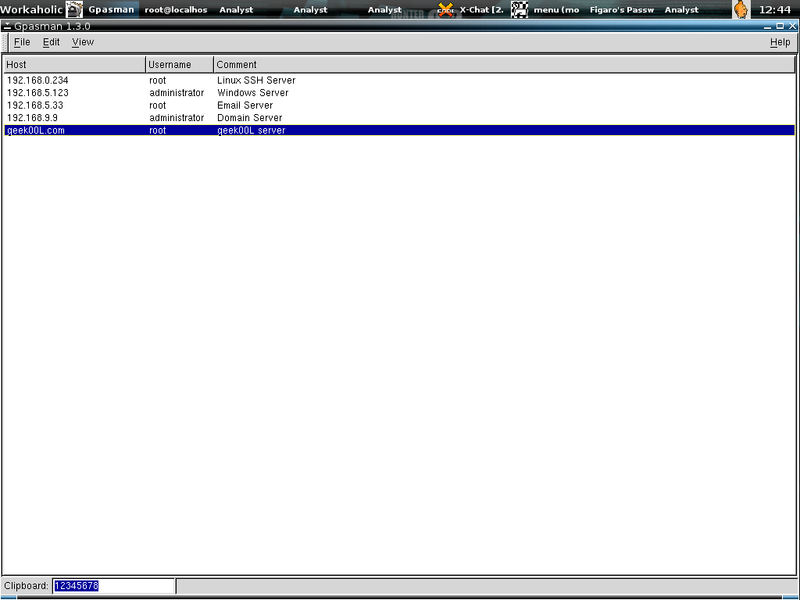 I have Open Office 2.0 working on OpenBSD 3.8 box as well, will blog it soon. You may have heard about bonding interface in linux that allows you to bind multiple network interfaces together into a single channel. Channel bonding enables two or more network interfaces to act as one, simultaneously increasing the bandwidth and providing redundancy. So if you are connecting your IDS sensor to the network tap, bonding interface is what you need since most of the expensive tap splits the stream into two, transmit and receive. You may find how to configure bond interface on RHEL/CentOS in InstantNSM documentation, or if your OS preference is FreeBSD, you may find the guide in taosecurity site. How about OpenBSD? 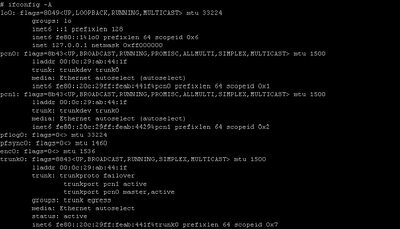 OpenBSD has introduced trunk interface in 3.8 release, and if you are always staying with Current or maybe you are always edging, you will notice they have even added failover capabilities for trunk interface, what is trunk interface anyway? Trunk allows aggregation of multiple network interfaces as one virtual inteface. All the network interfaces that configured to be single trunk will receive traffic from all attached ports. Ain't it similar to bond interface? I downloaded the latest OpenBSD and try to configure trunk interface, apparently it works and this is quick view of trunk interface. Serving as IDS sensor interface, we don't need to assign the IP address to the trunk interface which only used to sniff traffic in promisc mode as IDS sensor. 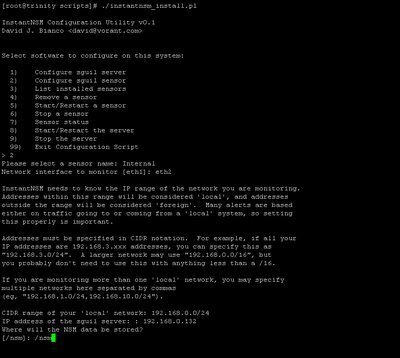 It is not mentionned in the trunk man page however you can configure trunk interface without assiging IP address, thanks to Richard who asking me to try it out. Here's the output, you may noteice pcn0, pcn1 and trunk0 are sharing the same mac address now, lladdr means mac address has been changed. However you should figure out their original mac address in the inet6 field. The default proto of the trunk interface is roundrobin, and even if you configure to use proto failover, it won't go failover unless one of the interface down. Proto here doesnt means IP or TCP protocol but the mechanism that used to trunk. If I run ifconfig trunk0 -trunkport pcn0, then pcn1 is still alive and receiving everything. The failover seems working well. That's what we need for the OpenBSD IDS sensor box - trunk interface corresponding to the linux bond interface. I have tested and updated the Sguil client installation script and now it works on OpenBSD-3.8, nothing much I have changed but it works perfectly now. I have uploaded it here. Here are the screenshots of my Sguil Analyzt Console on OpenBSD-3.8. 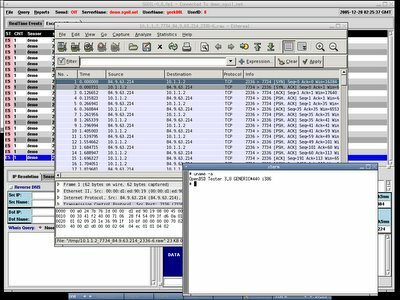 I'm sure most of you miss Ethereal on OpenBSD since it has been dropped out from package/port for the reason of being insecure, however since it is a must tool for network analyzt, we still prefer to keep it in our pocket. But the problem is many people keep getting problems and errors while compiling Ethereal from source. I'm fortunately enough to get to this url when googling which providing instructions of compiling Ethereal under OpenBSD, apparently it is not too hard. I have tested it under OpenBSD current and have little correction on that installation guide. 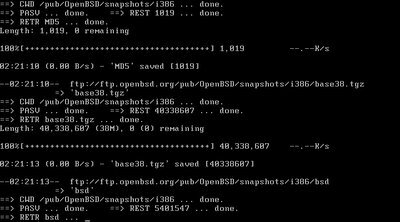 For quick setup, I install OpenBSD using latest snapshot, and use the package here since this is rather easy and fast to build system. Before you run autogen.sh, you will have to export autconf and automake version. You can make sure of it's version with ls /usr/local/bin/ | grep autoconf and automake, you should be seeing the version that has been installed, then we export it with the commands below. Make sure you have all the softwares installed before installing Ethereal, else you will be getting errors and won't be able to compile successfully. Today I'm having intermittent connection, again thanks to my ISP, I'm downloading OpenBSD snapshot since I need the latest OpenBSD to try out network interface trunking. It shouldn't be too hard to download by using wget and creating iso for the snapshot. Now the download resumes and I able to continue on it without problem. If the connection goes wrong again, I will be able to resume again with the same command. After the snapshot has been downloaded, I just need to run the commands below to create the iso for it. I prefer to put a date to keep track of iso I created because snapshot updates frequently. By now you should already have the OpenBSD_20051226.iso and you can burn it to CD using any kind of Operating Systems. I have uploaded my old Sguil Installation on OpenBSD to this location, it is based on Sguil-0.5.3 and I'm currently updating it to Sguil-0.6p1, however there are few things that I haven't figured out since there are lots of changes from 0.5.3 to 0.6. The sguil client script that I have uploaded is based on the script in sguil.sourceforge.net, however well tested on OpenBSD-3.6 since the one available in the sguil site is old, I'm currently updating it as well to fit in OpenBSD-3.8. Hopefully it may help people who want to get a start on Sguil using OpenBSD platform. Merry Christmas to everyone in the world, especially my family and all the OSS folks, you guys have been great and to all the geeks, get a life and stop being nerd, new year is around the corner as well and hopefully everyone is in delighting mood. My collegue has sent me this url, and it is one of the most enjoyable read. It seems the trend is changing and now geek is considered a lovable type and adorable. 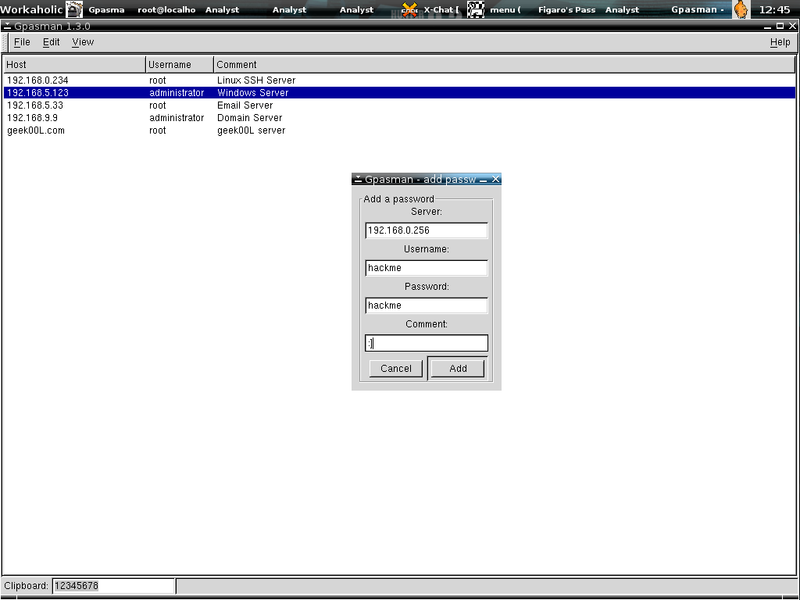 Again I have put everything together, this time I upload the softwares needed to run Sguil client on Windows. If you are using Windows Operating System, and you would like to connect to the Sguil Demo Server, now thing becomes easy and straight forward. By now you should be able to launch sguil.tk by using wish(tk) which is in bundled in Activetcl. To ease the installation of InstantNSM, I have uploaded all the components that needed by InstantNSM to one central location so that people who want to test or implement InstantNSM don't have to download sources from different locations which is troublesome. I will add the md5 checksum or maybe sha checksum for the source once I have my time on it. You can download InstantNSM component at this central location. Any changes or updates will be done following the InstantNSM build. It's good to hear that Paul is working on the Sguil port/package on FreeBSD, and Hanashi has decided to build rpm for all the components, the implementation of NSM will be much more easier than before either on linux or bsd platform. I have been using vmware since two years back, and getting used to it on either windows or linux platform especially the workstation edition. However for long I'm looking for the alternative which is oss base, I have been told by transporter(folk in freenode #snort-gui) that qemu is good, but I never give it a try until Kaeru(folk in freenode #myoss) told me that it is easy and fast enough when loaded with the accelerator. Thought that might be a good replacement for vmware if the perfomance good enough since Open Source virtual machine tend to be slower. I have tried out qemu with accelerator loaded on freeBSD, with virtualization instead of emulation, I can see a perfomance boost and found a benchmarking site noted it's perfomance close to native, thanks to the Kaeru's qemu guide. I'm still testing on it's networking features and perfomance of qemu, if everything goes fine, I bet I will no longer using vmware. 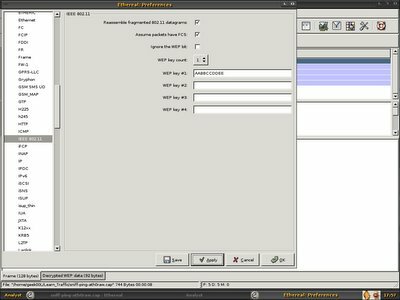 If I'm not forgotten, Richard [at] taosecurity.blogspot.com has mentionned that he prefers to create a vmware image for it's NSM build with vmplayer released, i think Qemu is good enough for that environment since it has almost the same functions and usabilities. I have installed centos 4.2 on qemu, and preparing to setup instantNSM on it. If everything goes fine, I will offer the virtual machine image for downloading so that anyone can try out and have fun with NSM. Qemu - We love OSS!!!!! If you are using InstantNSM for Sguil setup, everything becomes easy and handy. After you have proper setup of everything, and you want to add another sensor so that you can watch out another network segment, adding additional sensor for Sguil in one Box becoming painless process, just 3 steps will do. 1. Plug in add on Network Interface which will be configured as the sensor, for example eth2. 2. Download snort rules, untar it and copy all of them to /usr/local/snortrules-$SENSORNAME, ignore the doc directory since it is not used by sguil. 3. Run the InstantNSM script, it's Q & A base and everything will be brought up in minute. There you get your additional Sensor named Internal. Joy to the FreeBSD users, scapy port is available now, you can check it here. From now on, you just need to pkg_add -r scapy and it is in, I haven't tried out yet, since my own scapy install is working fine, maybe I will try it soon on another FreeBSD box. Thanks to garga for the port and now I would hope it is ported to OpenBSD as well. Thanks to Hanashi, and with that I have mysqltcl rpm package under /usr/src/redhat/RPMS/i386 directory. If you don't have rpmbuild, just yum install rpm-build will do. 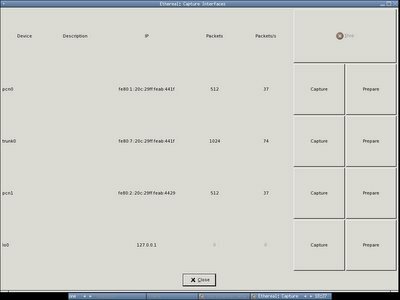 Below is the screenshot of my first InstantNSM build, I will add more sensors to see how things go. For people who haven't noticed, Nessus 3 is released, it moves to close source however it is still free, and for people who use Nessus 2, there are upgrades and improvements made for it, I will try on Nessus 3 since it would be fun to do so. 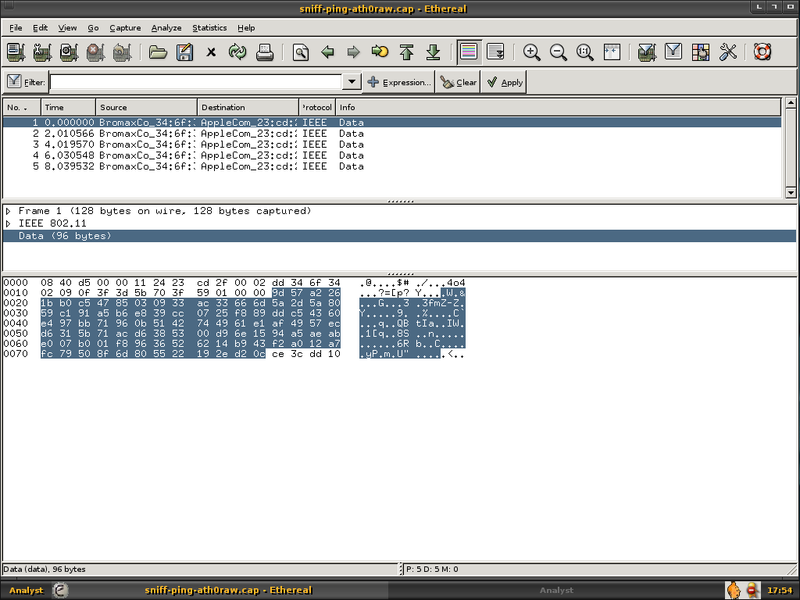 In order to resolve it, I decided to ask him to send me the pcap file so that I able to decode it. He sent me two files, sniff-ping-wlan0.cap and sniff-ping-ath0.cap. Once I got my hand free, I loaded these two files in ethereal and apparently one packet with the data of 92 bytes and another one with the data of 96 bytes. 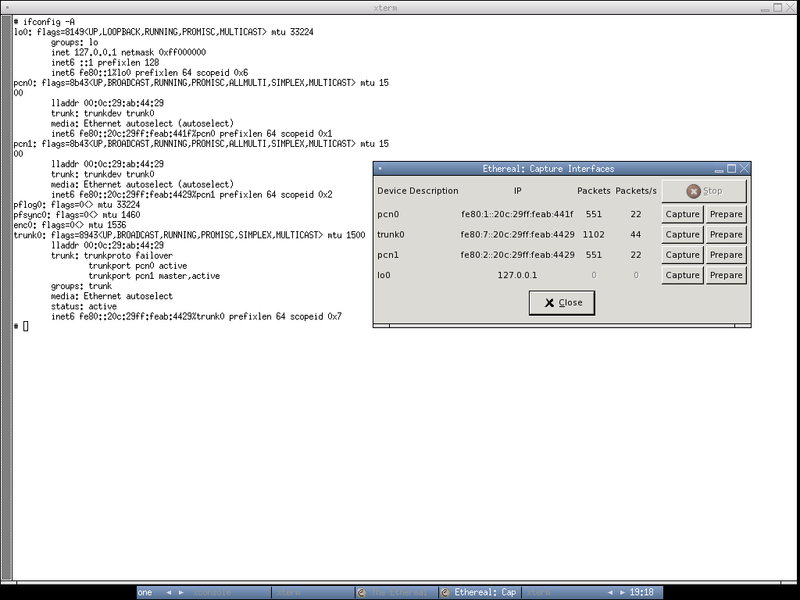 This is sniff-ping-ath0.cap with additional 4 bytes. 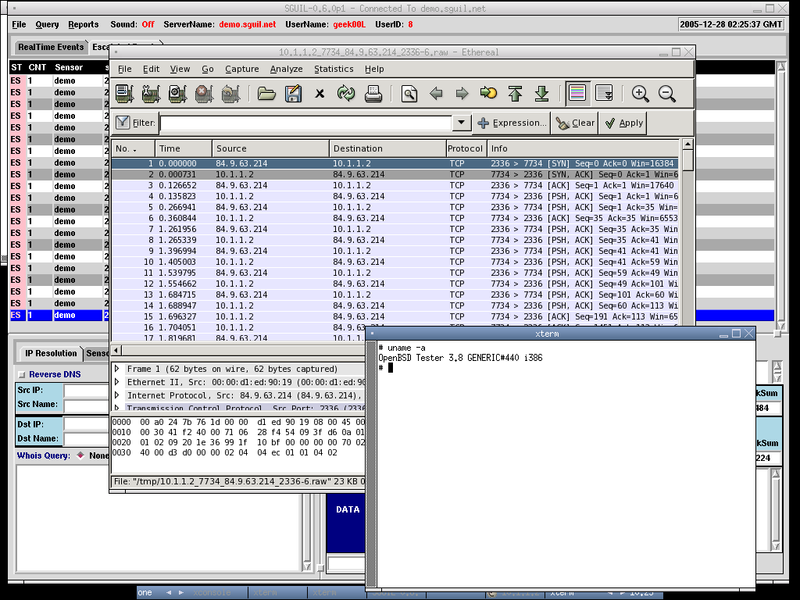 The packet itself is WEP enabled, I can't do much and decide to browse through the packet header and one thing caught my eye -ICV, ICV is 32 bits integrity check value, it is a checksum value that the receiving host calculates and compares to the one sent by the sending station to avoid tampering of frame integrity. It's weird that ath0 and wlan0 has the same packet with different ICV. Check on Assume packets have FCS, WEP key count = 1 since only one WEP key is supplied and used. I decide to go with fcs disabled for wlan0, I'm just go for quick guess because most properly the additional 4 bytes is at the trailer and wlan0 without additional 4 bytes maybe without FCS in the packet. For ath0 packet, I checked on FCS, to try out my luck. 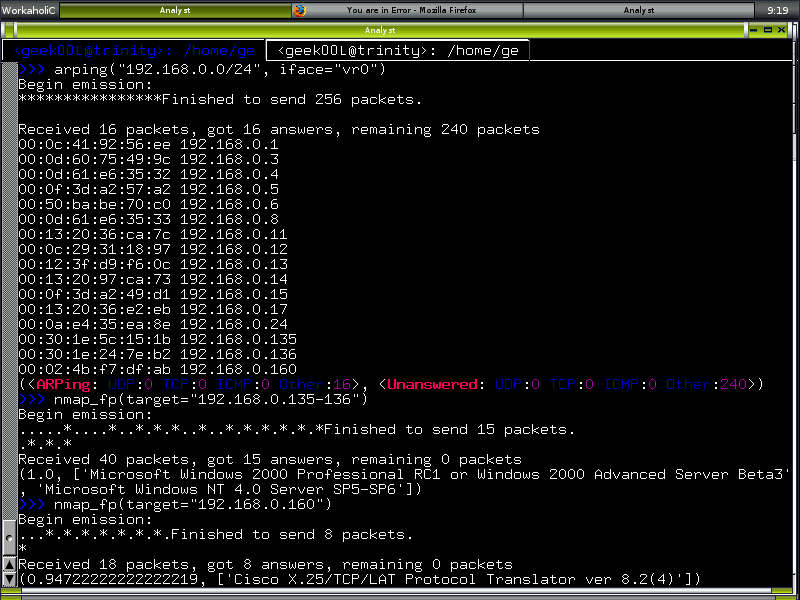 Wonderfully both packet get decrypted as expected, and it is actually ICMP echo request. 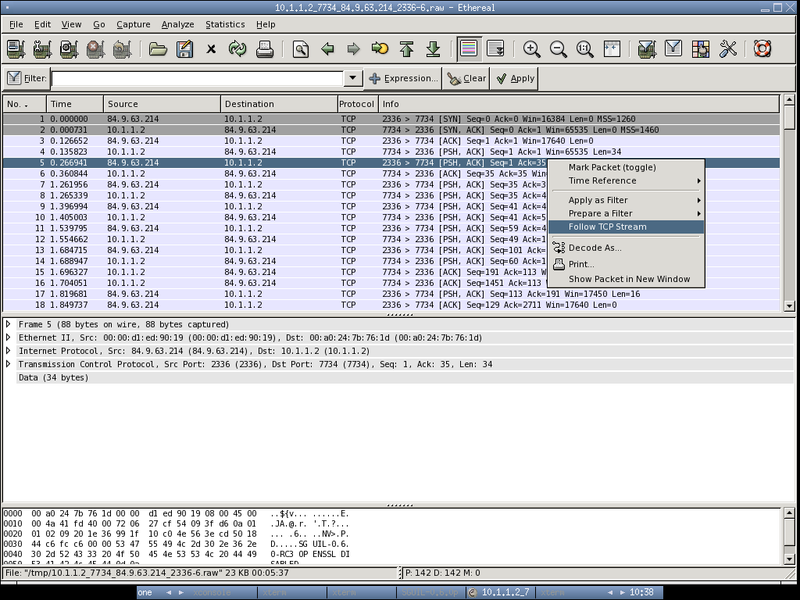 Both packet has the same WEP ICV, it is clear that the additional 4 bytes(ce3dcc10) is Frame Check Sequence. Yesterday I went to the post office to pay bills, however when I reach the front door, they put up a sign board with the cool excuse - "Post Office closed, computer spoilt!" and it was Monday 2pm. I'm kind of feeling "WTF" seeing all the employees in the Post Office inside chit-chating there and not working. Can you tell me what kind of Post Office System is this, it sounds really ridiculous to have all the computers spoilt at the same time and there's no backup, this is not only causing total loss of the people who come and pay for bill or mailing, but where is the reputation of Malaysia Post Office anyway? I'm pissed, nobody can accept this excuse, so do I. One of my favourite analyst tool - Ethereal, get exploited again! If you are using ethereal or Sguil in one box, most properly you need to patch your ethereal, don't get your box 0wned. Check out the link here. I have posted a request in the Helix forum for the upgrade of PyFLAG, the latest PyFLAG which is version 0.78 has a new function called Network Forensic. 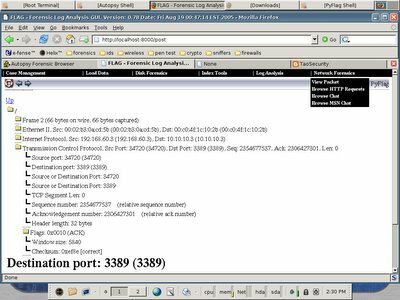 Now you can load your pcap file into PyFLAG web interface, and access to the packet content to perform Network Forensic. 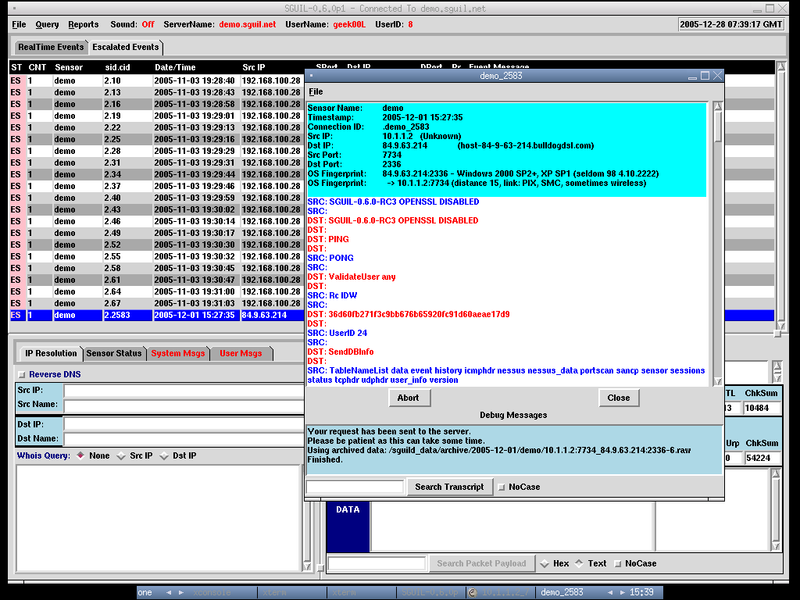 Hereby I have posted the screenshots of Helix 1.7 and PyFLAG-0.78, I have downloaded the pcap file from taosecurity.blogspot.com and load it to the PyFLAG for packet navigation. 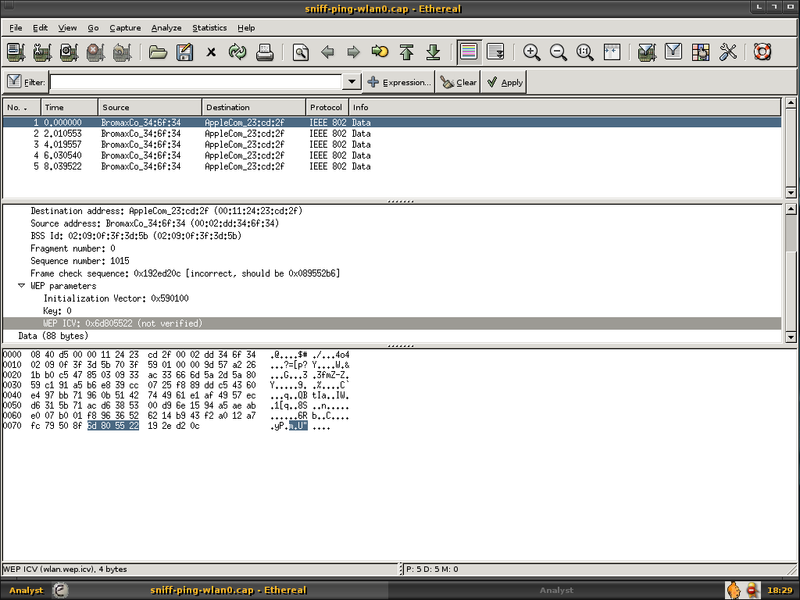 This is PyFLAG in Helix, loading single packet content in it's web gui. There are functions like Browse HTTP request and etc to ease your work. The only thing I feel dissapointed about Helix is that Sguil client no longer available, but maybe that's the purpose of Helix, which is Forensic Centric, however one should know you may able to perform Network Forensic with Sguil. If you are system administrator, or maybe network administrator, most of the times you will be sticking to multiple servers no matter they are windows, *nixes variants or cisco router. I bet no one will remember all the pasword/passphrase even you have very good memorizing power. A good password manager may ease your work, there are not much alternatives for *nixes system. Normally I use these two password managers that available in freebsd packages/ports - Gpasman and Figaro's Password Manger(fpm). I prefer Gpasman for it's simplicity and Figaro for it's scriptable ability. Maybe the only thing you worry is that once your password storage files get stolen, you will be in trouble however since the file itself is encrypted, it may take times for the bad guy to reveal the password, and you should have enough time to change your password at that moment. Below are the screenshots of these two passoword managers, you may spot the differences. And simple configuration of course. Which is more flexible, and the if you click on the jump button, directly you execute the command and login to the servers. Eventhough Gpasman is easier, however you have to copy the password to clipboard manually and insert to the program you use. One best part about these two programs is that when you plan to rebuild your system and lazy to reconfigure it again, just copy out the file .gpasman and .fpm directory, place it back to the user directory once you have the new system setup, so it is configured once, use it everywhere, that might help other system administrators who has same system login database as well. I think Gpasman developement has stopped while figaro is still under active developement. However both are worth to at least give it a try. Just right after I blog about honeyd, I read about Mambo bot, myspace worm was a shock and now more and more Web Based Worm merging, this could indicate that next generation worm not only targetting users anymore but vulnerable server, this is not a good sign because there are many users out there deploying cms such as phpbb, mambo and etc without maintaining it and tracking the latest version which fixing vulnerabilities. There are ways to track the Mambo bot, since it search for other vulnerable servers through google search engine. GHH- Google Hack Honeypot is one of the possible way to track Mambo Bot. Maybe I should spend sometimes on Google Hack Honeypot Deployment when I have enough time. Check it out if you feel interested. That was two years back when I started using honeyd for my own research and stop after version 0.8, it's time to revisit the honeyd since v1.0 sounds mature enough :], and I would like to see the differences of it compared to previous version. The obvious changes would be arpd no longer needed and dhcp is supported, honeyd has it's own management console and even though it's not in mature stage, however it would be kind of useful especially you can easily troubleshoot your setup with it. 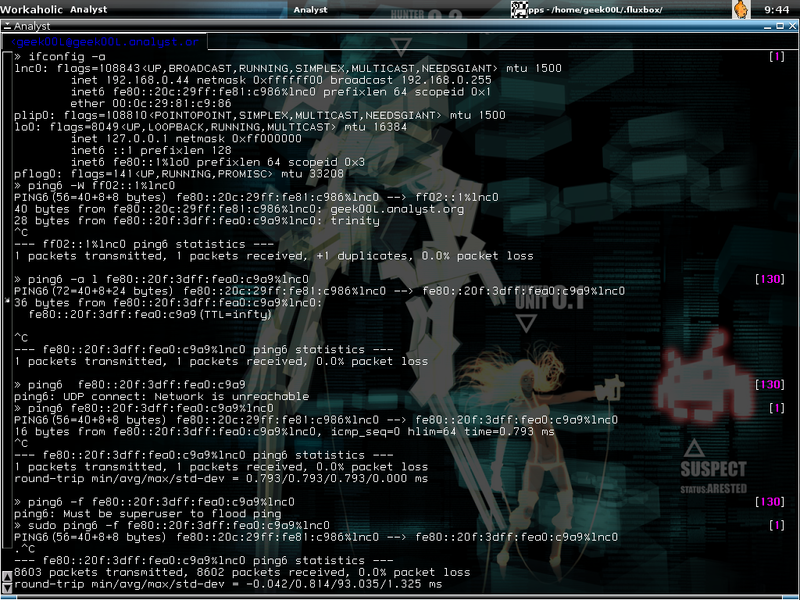 Hereby I will demonstrate a simple setup of honeyd on OpenBSD, and testing it using Scapy and Nmap. 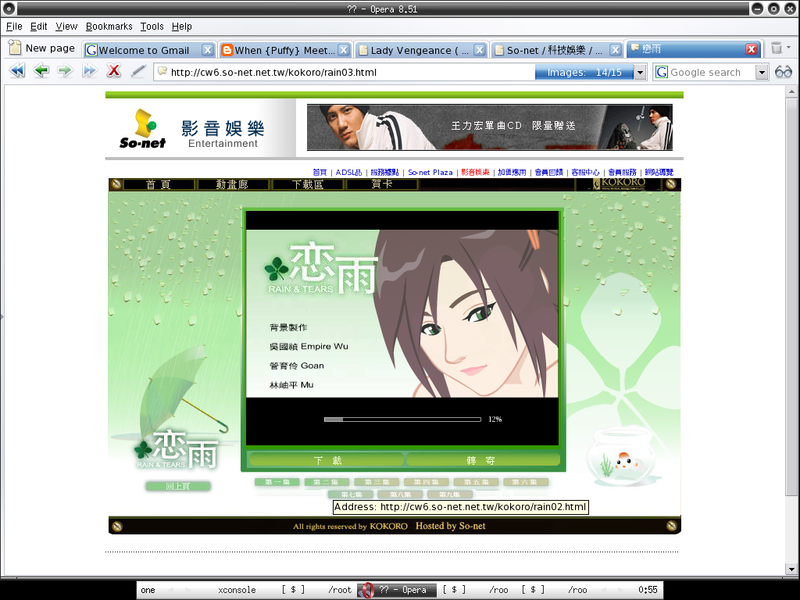 The installation itself will create a user _honeyd since it's not wise to run honeyd as root. Now you need to create two logs for the user _honeyd. 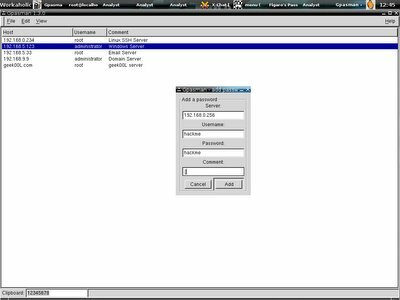 You can start the configuration of honeyd by now, I just configure a simple one that consists of two windows 2000 advanced servers and one cisco router. Below is my /etc/honeyd.conf file. set windows personality "Microsoft Windows NT 4.0 Server SP5-SP6"
add windows tcp port 80 "sh /usr/local/share/honeyd/scripts/web.sh"
#dhcp windows on pcn0 ethernet "3com"
set router personality "Cisco 1601R router running IOS 12.1(5)"
add router tcp port 22 "/usr/local/share/honeyd/scripts/test.sh"
add router tcp port 23 "/usr/local/share/honeyd/scripts/router-telnet.pl"
One of the thing worth to be mentionned is that you are now able to spoof the MAC address of the certain vendors like cisco, 3com and etc. This is rather good to avoid the detection of virtual honeypot since most properly Cisco Router would use their own Cisco NIC. Take note of the bold line above. We can now start running honeyd by using the commands in the screenshot. 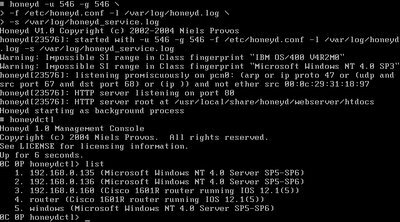 By using honeydctl(honeyd management console), we can list out our virtual honeypots, 192.168.0.135 and 192.168.0.136 are my simulated windows servers and 192.168.0.160 is my simulated cisco router. 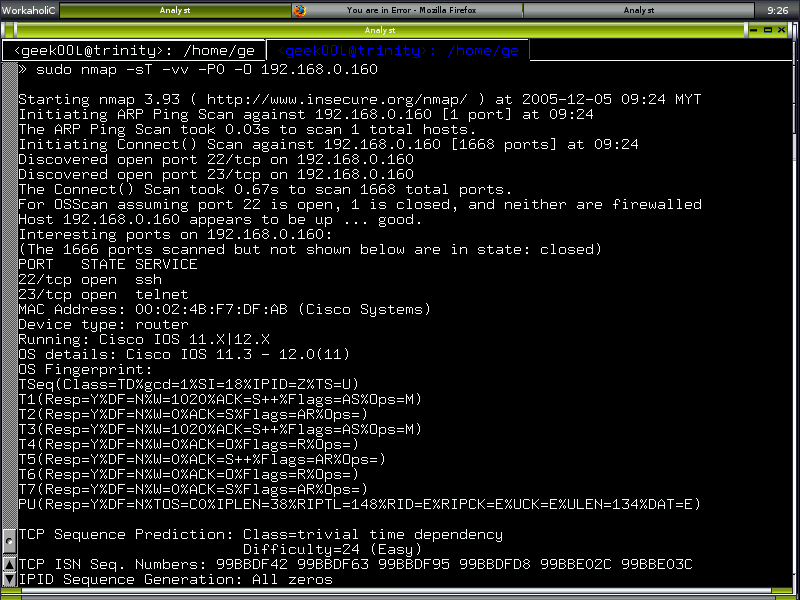 To test against whether the honeyd is setup properly, I launch up Scapy, using arping and nmap_fp to fingerprint it. 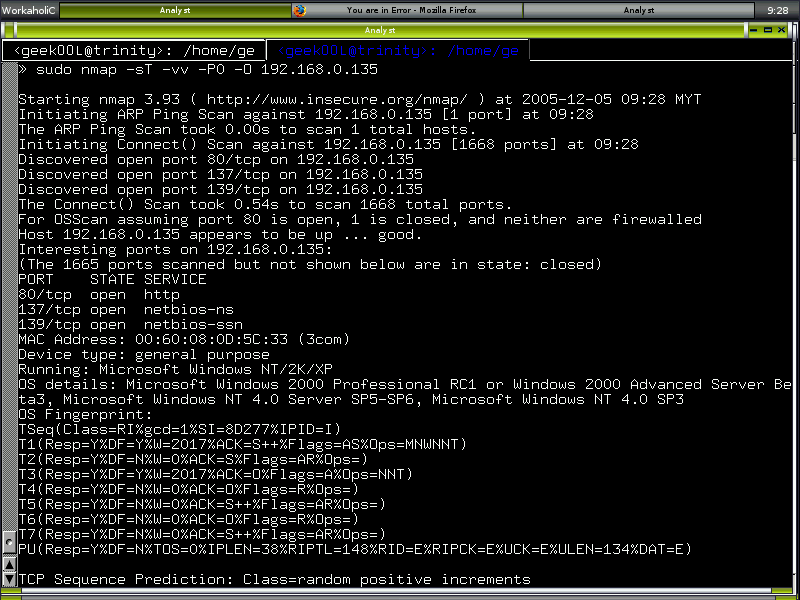 Apparently the result is matching my setup, let's see how about running testing by using native Nmap. 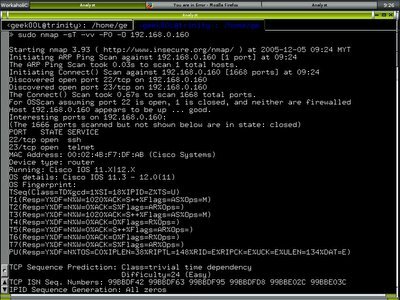 There are two screenshots below, the first one is running nmap against Windows box and the second one is against the Cisco router. To monitor who is connecting to the virtual honeypot in real time. To stop all the honeyd process. We have seen improvment in honeyd so far, and what I noticed in the TODO file from the honeyd source tarball is that some simulated operating system don't support defragmentation, maybe OpenBSD PF scrub function might do the trick for it, and I can't wait for the function of start, shutdown and reboot simulated OS by using honeyd management console. Honeyd becomes least popular for honeypot setup in the real world and the one that take over would be the next generation honeypot such as mwcollect and nepenthes. Both are more close to the malware collection honeypot. Honeyd simulating the OS level is not attractive enough for the malicious users nowadays, on the other hand mwcollect and nepenthes simulating the vulnerable applications would be more attrative to the bad guy. I decide to write about windows security stuffs for mydefcon.org since I want my blog to be more *nixes centric, so you may check it out there. The first write up is Windows Incident Response tips since I'm always emphasizing on defensive security related stuffs. Hopefully I able to steal some times to write more. If you are in Penang, feel free to join the mydefcon monthly meetup and banging with those nerds there. For people who use IDS, this is one of the enjoyable article - Evading NIDS, revisited. For people who use Sguil, Sguil-0.6.0 is out, check out the sguil demo if you don't know what it offers. I'm working on dissectible.org contents and might be having it up as soon as possible. For people who want a free IPv6 address space, you can go for the IPv6 tunnel broker, this is one of my preferred tunnel broker - BT Exact. What I really like is that it cooks well with my DSL connection of which detecting the changes of my dynamic IP and notify me, hence it's FREE with term and conditions. However here I will show IPv6 in LAN and the usage of IPv6. Let's acknowledge myself not a expert of IPv6 and currently trying to understand it, so what's make IPv6 difference than IPv4? There are more to mentionned, however here's the few points I want to make, when IPv4 was invented, they are not considering security as an issue, instead they are more concentrating on network issue. Nobody ever think of IPv4 address space will be exhausted that fast since 2^32 is a huge number. Now I will show ping6 in IPv6 LAN, the ping for IPv6. Clearly enough making use of IPv6 is fun since ssh, apache, dns and all those services that are protocol independent working well in the IPv6 Environment. Since it's in the LAN, so we are most likely tinkering with IPv6 over ethernet, so normally you will be able to query or connecting to link-local address. The link-local address of lnc0 is fe80::20c::29ff:fe81:c986, you might notice the %lnc0 behind it, it indicates the scope-id. You will have to specify scope-id as well while using ping6 in the LAN or site-local address, this is not neccesary when you are trying to ping IPv6 glocal address. 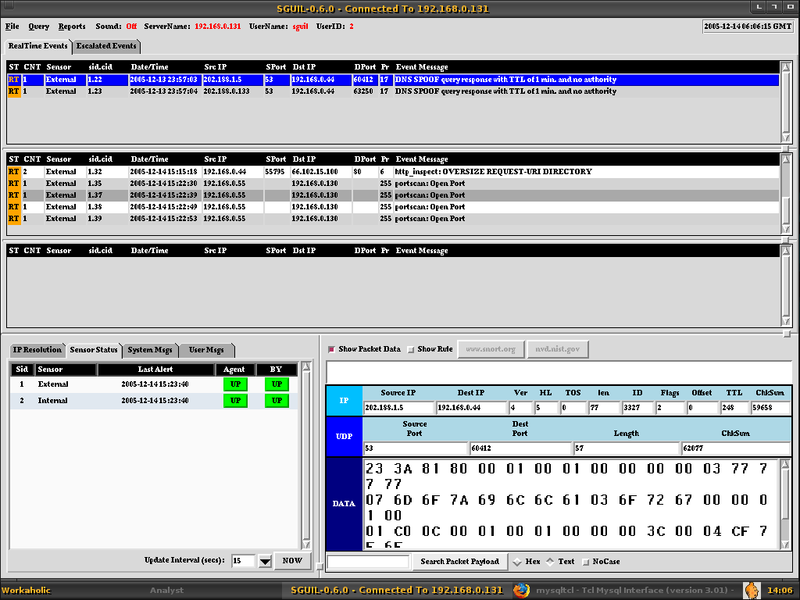 Scope-id is the interface index for the interface to which the link-local address is assigned. Link-local address starts with the prefix of fe80, and the suffix(last 64bits) or we call it interface identifier is using MAC address. However since MAC address is only 48 bits, it splits into two part, the oui of MAC address(first three octets) becomes the company id, the fourth and fifth octets of the are set to the fixed value FFFE hexadecimal, and the last three octets is added behind it. So you might see MAC address of 00:0c:29:81:c9:86 to be 20c:29ff:fe81:c986, remember 0 is always been suppressed. You might see the result indicate there's a duplicate packets, this is normal when you are doing multicasting since all of the nodes replying to same request, however if you have duplicated packets when doing unicast, there's something wrong with your hardware or misconfiguration. You will also see I unable to ping and getting error message of udp connect: network is unreacheable when I'm not pinging with scope-id. Ping6 -f is a flooding ping and it requires root priviledge to run, I just putting it here for fun. For people who curious how a single node discovers the other nodes in the ethernet network with the command of ping6 -W ff02::1, it is actually sending a packet with ICMPv6 Node Information Query(type 139 Code 0), all other nodes that receving the Node Information Query will reply with the packet of ICMPv6 Node Information Reply(type 140 Code 0) together with the dns label(hostname) such as trinity. There are more to learn about IPv6, however one should learn IPv4 before learning IPv6 since foundation is the most important thing. Learning new stuff is always fun. This command will automatically detect your hardware specification and generate the xorg.conf.new as a template under your user home directory. Now you are done with Xorg. Now you won't need to export the package path manually everytime you login to the machine. You can either use port or package install. I suggest you copy all the files under /usr/local/share/fluxbox to you user home directory. If you prefer to use GDM - gnome display manager instead of xdm for it's nicer and rocking interface, let's go get it. # Alternatively, on some architectures, xdm may be started in /etc/ttys. Then, change the xdm_flags="" in /etc/rc.conf.local to gdm_flags=""